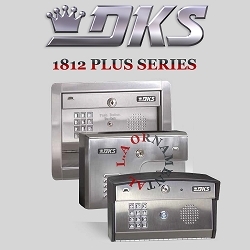 The 1812 Access Plus is our top-of-the-line access control and communication system for residential applications. The 1812 Access Plus is PC Programmable and IP Addressible. Once you install the Access Plus Account Manager software on your PC, you can easily connect it to your home network and even program the system and receive reports via the internet. The 1812 Access Plus controls a main door or gate and can easily be expanded to control up to six additional access points. The 1812 Access Plus features an upgraded processor, a new high fidelity digital voice circuit, better volume control, a lighted push-button and additional call out telephone numbers (up to 27). Discerning homeowners will appreciate the additional programming, reporting and advanced features found in the 1812 Access Plus system. IP Addressable – uses TCP/IP communication to program the system from your PC via LAN/WAN or an Internet connection. Answer machine bypass feature allows the homeowner to call the 1812 from an off site location and “by-pass” a home answering machine to perform programming operations.